Geany is a small IDE that loads quickly. Geany comes with an optional project management feature. Each project can have project-specific build features. 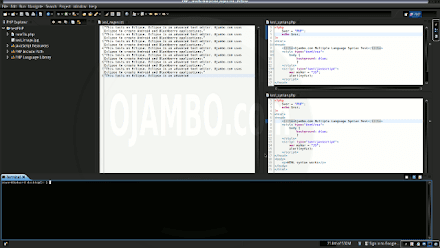 A Video for the Ojambo.com Eclipse Advanced Editor Review article. 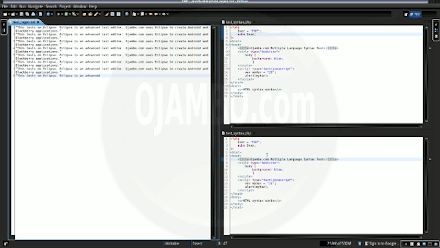 Eclipse is a Java-based integrated programming environment (IDE). Eclipse is free, open source and cross-platform (Mac, Windows and Linux). Eclipse is a free IDE for Java from http://www.eclipse.org. There are downloadable packages for Linux, Mac and Windows systems. Eclipse can easily be extended by plug-ins to develop applications in other programming languages. Regex file: text with word “Eclipse” repeated. Eclipse was downloaded from the developer’s website for portability. Eclipse and its plug-ins are bloated. I did not wish to reinstall Eclipse every time I changed my distribution. Eclipse was installed on a separate partition that is immediately available for other installed Linux distributions. All plug-ins such as Android and Blackberry were installed once and never require re-installation. The theme cannot be native for the editor in terms of the background. Eclipse dark and light themes can be created or downloaded. The score for the theme was 0.5. Dragging and dropping a text file into the editor opens a new tab. It is possible to specify the tab location during the drag and drop operation. The score was a perfect 1.0 for drag and drop into editor. Opening a very large text file did not crash Eclipse. An out of memory window was shown and it was not possible to edit the large file. The score for opening a large file was 0.5. Multiple documents can opened in multiple tabs. Tear-off tabs do not work because Eclipse cannot not be opened as multiple instances which is handy for multiple monitors. The score for multiple documents was 0.5. Soft word wrap requires a plug-in by CDHQ.de called Word-wrap. Automatic soft wrap for documents is not available for Eclipse. The score for word wrap was 0.5. Word count is not available for Eclipse. Selection word count is not available. The score for word count was 0.0. Fonts cannot be dynamically scaled. The system font can be bypassed and a new editor font and size can be set. The score for fonts was 0.5. Multiple selection is not available for Eclipse. Search multiple selection is not available. The score for multiple selection was 0.0. Terminal requires a plug-in by Google called Terminal. The terminal does not follow folder. Terminal can execute system commands. The score for terminal was 0.5. Eclipse is a very powerful IDE. By default, the Eclipse editor is missing required features which can be installed by using extensions. For my required features, the Eclipse editor scored 70% or 7 out of 10. Eclipse is a very powerful integrated programming environment. Basic editor features are missing in Eclipse. Important editor features require Eclipse plug-ins. Overall Eclipse only scored 7 out of 10 for essential text editor features. Eclipse is able to use most of the system native theme and fonts. Eclipse has one of the best multiple editor views available for any editor. The select rectangular block is one of the easiest to use of any editor. Look for required plug-ins before deciding to try Eclipse. Download Eclipse from the developer’s website. Install Eclipse in a permanent location.